Another vulnerable place on the West Antarctic ice sheet is Pine Island Bay, where two large glaciers, Pine Island and Thwaites, drain about 40 per cent of the ice sheet into the sea. The glaciers are responding to rapid melting of their ice shelves and their rate of fl ow has doubled, whilst the rate of mass loss of ice from their catchment has now tripled. NASA glaciologist Eric Rignot has studied the Pine Island glacier, and his work has led climate writer Fred Pearce to conclude that ‘the glacier is primed for runaway destruction’. Pearce also notes the work of Terry Hughes of the University of Maine, who says that the collapse of the Pine Island and Thwaites glaciers — already the biggest causes of global sea-level rises — could destabilise the whole of the West Antarctic ice sheet. Pearce is also swayed by geologist Richard Alley, who says there is ‘a possibility that the West Antarctic ice sheet could collapse and raise sea levels by 6 yards [5.5 metres]’, this century. 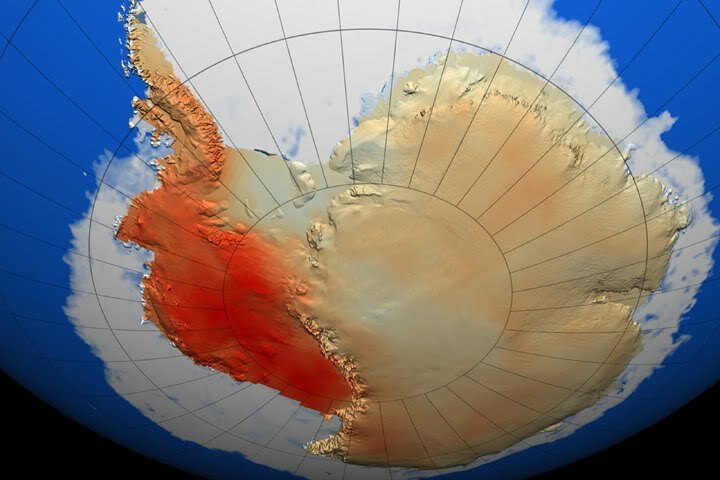 While the inland of East Antarctica has cooled during the last 20 years, the coast has become warmer, with melting occurring 900 kilometres from the coast and in the Transantarctic Mountains, which rise up to an altitude of 2 kilometres.